Here is an intelligence agent's shocking report offering evidence that at least some flying saucers COME FROM INSIDE EARTH. 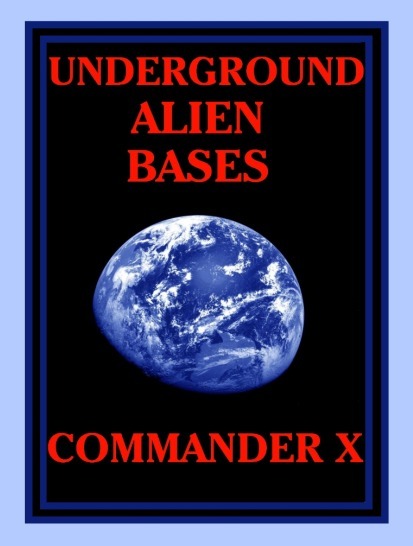 Aliens have established underground bases around the planet. An ancient tunnel system has existed since the time of Atlantis. Entrance ways can be found in many major cities. Some government and military officials have taken the side of the aliens in an attempt to control earth's human population. Aliens have established bases around the planet. An ancient tunnel system has existed on Earth since the time of Atlantis. Entrance ways can be found in many major cities. Some government and military officials have taken the side of the aliens. Here are bizarre stories about underground bases at Dulce, New Mexico; Groom Lake, Nevada; The South and North Pole; Mt. Shasta, California, as well as in the Andes. Here also are the first-hand reports of individuals who have been abducted, and have survived genetic experiments in these locations. This entrance to the caves now lost, was discovered by a laborer, who was digging in a lonely field somewhere in Staffordshire, England. The exact location of the field and entrance has never been discovered. However, the story is related in A History of Staffordshire, by Dr. Plot, who wrote the book in the late 1770s. I shall relate the highlights of the events as they appear in this ancient historical book. A dull, ignorant laborer was digging a trench in a field which lay in a valley surrounded on almost all sides by woods somewhere in Staffordshire. The sun had gone down and the laborer, who later related his experience, asserted that just as he was about to stop work, his pick hit a large flat stone. The stone had an iron ring mounted in it. He stayed and cleared the stone, which was in the form of a large oblong. His attempt to pry the stone up was met with failure, but he utilized ropes he had brought to obtain more leverage and managed to slide the stone over. This revealed a stone staircase, which sloped down into the Earth. Since this first thought was that this might lead to an ancient tomb containing treasure, he gradually descended the stone stairway. While looking back, he could still see the sky glowing with the last light of the sun. His descent continued until he was about, according to his estimation, 100 feet underground. It was at this point that he suddenly reached a sort of landing. The planet Venus had risen by this time and was shining directly down the shaft, so that he was able to discern the beginning of another stairway, which descended at a right angle to the first one. The possibility of a treasure in gold or jewels, made him feel his way in the darkness down another 120 steps. At the foot of these steps was a turn, and far below down another long flight of stone steps, he could see a pale but steady light. While descending this long flight of steps, he heard the sound of some sort of machinery or the rumble of a large vehicle somewhere far in the distance. He paused, frightened, but the sound was gone and in the surrounding stillness, he forced himself to go forward toward a light which glowed unnaturally in the bowels of the Earth. Reaching the end of the steps, he found himself in a large stone chamber, the roof of which seemed far above him and the walls of which he could not see even by the light of a globe, which glowed on the floor before him. Suddenly a hooded cowled figure appeared from some side passageway. This being pointed what he described as a baton-like object - or as we would understand it, a tube - at the light and destroyed it with a thunderclap, which echoed and reechoed through immeasurable subterranean passageways. Commander X is a former military intelligence operative whose other works include TIME TRAVEL: A HOW TO GUIDE, INVISIBILITY AND LEVITATION, THE CONTROLLERS, COSMIC PATROIT FILES, COMMANDER X FILES.